The Dream Wheel is a third-party Sega Dreamcast racing wheel released by Mad Catz. With the exception of pedals, the Dream Wheel differs little over the official Race Controller. 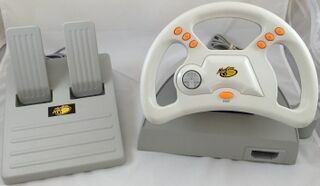 Much of its design is borrowed from previous Mad Catz wheels (for example, the the Sega Saturn's Analog Steering Wheel).